Harare Magistrate Francis Mapfumo today dismissed opposition leader Tendai Biti’s application challenging his prosecution on the grounds that he was seized from Zambia and illegally brought to Zimbabwe. Magistrate Mapfumo ruled that there is no basis to permanently stay Biti’s prosecution as he was properly arrested and arraigned before the court. “The accused person was fleeing jurisdiction of the court. Zambian government surrendered him to the Zimbabwean government and the police made legal arrest and given this scenario there was no need for the state agents to abduct him, therefore the application by the accused is dismissed,” said Magistrate Mapfumo. However Biti’s defense counsel led by Alec Muchadehama said they will proceed with the matter to High Court as they felt Mapfumo’s judgment was not fair to the accused. 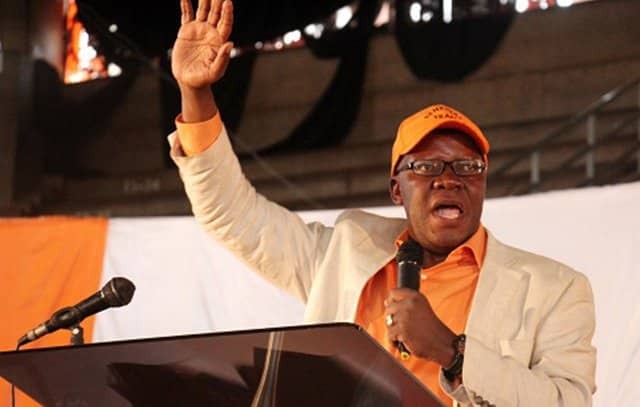 Biti is being charged for contravening Section 36 of the Criminal Law Codification and Reform Act Chapter 9.23 for public violence and also contravening Section 66 (a) (1) of the Electoral Act Chapter 2.13 for announcing unofficial results.